If you’re a savvy Instagrammer, a keen blogger, a dab hand with a drone, or just someone getting inspiration in nature and unusual travel experiences, then a trip to Sri Lanka could be just the thing to elevate your social platform into the limelight. Recently named the top travel destination for 2019 by Lonely Planet, this country is awash with incredible landmarks, breath-taking scenery, and unforgettable experiences. So pack your laptop, your camera, or your X Pro and read on to discover the ultimate digital nomad spots in Sri Lanka in 2019! If you’re an enthusiastic travel writer on the hunt for the most amazing locations to inspire your next blog post, then check out our digital nomad’s guide to Sri Lanka for keen bloggers! If you like the idea of creating a blog post about the magnificent wildlife of Sri Lanka, then Udawalawe National Park should top your list. Covering over 300 square kilometres, the park comprises of rugged grasslands and exotic forests, and is home to a large number of wild elephants. You’ll also get the chance to encounter Water Buffalo, Spotted Deer and the native Toque Macaque, as well as the elusive Sri Lankan Leopard! If relaxing by the sand is more your scene, then head straight to Mirissa on the south coast. As one of the top digital nomad spots in Sri Lanka in 2019, Mirissa boasts spectacular beaches worthy of any writer’s imagination. Indulge in a spiritual yoga retreat or head to surf school to catch a few waves. Plus with whale watching in the region’s rich waters, quiet coves like Secret Beach Mirissa and snorkelling at Polhena, this southern resort is enough to free up any amount of writer’s block. Book train tickets to Matara, approximately four hours from Colombo. Get off at Welligama, which is the closest Station to Mirissa, and from there, take a tuk-tuk to the beach. ¡Anuradhapura dates back to 380 B.C. and is one of the best digital nomad spots in Sri Lanka in 2019. If you prefer to head to the city, explore the ancient landmarks of Anuradhapura for ultimate writing inspiration! As the first capital of Sri Lanka, this captivating city dates back to 380 B.C. and is home to some of the most famous and magnificent ruins in all of Southeast Asia. From ancient statues to holy temples, there is a spot here to aid your writing! Anuradhapura is roughly five hours by bus from Colombo or can be driven to in four hours. Take a bus to the station in Anuradhapura New Town. Regular trains also runs here from the south of the island. Just over 100 kilometres from the former capital, you’ll find the perfect spot for another dose of history. Once the royal seat of Sri Lankan kings, Polonnaruwa is home to some of the country’s most amazing archaeological treasures. This rich ancient park harbors sacred tombs and temples, including the unforgettable Royal Palace ruins of the Quadrangle – the only place you’ll need to go to spark your imagination! Take a look at some of the country’s other iconic destinations, with our guide to the Instagram hot spots that went viral. There is a direct bus from Anuradhapura bus station to Polonnaruwa, which takes around three hours. There is also a bus from Kandy that takes around four and a half hours. The ultimate digital nomad’s guide to Sri Lanka would not be complete without a trip to Pidurangala. Offering some of the world’s most beautiful landscapes, this mountainous area is ideal for inspiring hiking excursions. When you reach the top, take in captivating views of Sigiriya, one of the country’s most acclaimed treasures. Hike to the summit of Pidurangala for 360-degree views, while an early morning walk will allow you to enjoy a picnic as the sun begins to rise. While you’re there, don’t miss Pidurangala Vihara, an ancient Buddhist temple carved into the rock. You can reach Pidurangala from Kandy by car in just under two hours, or from Anuradhapura in just over an hour. Galle offers plenty of opportunities for digital nomads! The coastal city of Galle is awash with things to do. The fortified city was founded by Portuguese colonists in the 16th century and offers impressive European architecture, right by the ocean. Explore Galle Fort, swing by the city’s iconic lighthouse and soak up the rays on mesmerizing Unawatuna Beach, because if you want to explore Sri Lanka for digital nomads, Galle is a great place to start! 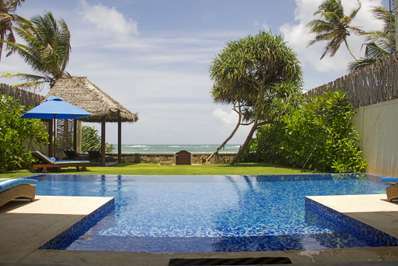 Make the most of your visit by staying in one of our impressive villas, within easy reach of Galle’s beautiful beaches. From Colombo Fort take a taxi or hop on the 112 or 138 bus from the centre of town. Get off at Maharagama station, around 75 minutes, then take a second bus to Galle. Our digital nomad’s guide to Sri Lanka would not be complete without giving you the low-down on the best spots for capturing truly remarkable Instagram images. If photography is your bag, and you need some awe-inspiring shots to set your Instagram feed alight, then these amazing spots should head to the top of your list! Offering some of the best sunsets on the island, Tangalle is a lure in Sri Lanka for digital nomads! With golden sands fringed with palm trees, the coastal town harbors plenty of hidden coves and bays for perfect photo moments. Head to the beach for sunrise or sunset to capture the horizon, or plan your visit around the Sea Turtle hatching, to light up your Instagram feed with spectacular wildlife shots. Shuttle buses run from Hikkaduwa railway station to Galle railway station. From there, take a train to Matara and then a bus or taxi to Tangalle. With wild forest trekking routes, idyllic tea plantations and endless opportunities for inspiring imagery, Ramboda is one of this island’s true gems of Mother Nature. The digital nomad’s guide to Sri Lanka would be incomplete without a waterfall stop, and the Ramboda Falls offer the most possibilities for amazing social grams. While you’re there, don’t miss the Puna Ella Falls or the hillside Palagolla Temple. From Colombo, take a bus (around a four-hour journey) or travel by train via Peradeniya to Ramboda (roughly three and a half hours). From Nuwara Eliya drive or take a 35-minute taxi, costing around 2,300 LKR. If you prefer to get immersed in city culture, then a visit to Colombo is a must for you. Of all the digital nomad spots in Sri Lanka in 2019, Beira Lake will allow you to capture the skyline of the city, while taking in tranquil Buddhist statues that line the lake’s edge. As one of Colombo’s most famous and popular landmarks, the lake is the perfect place to take some enduring photos of the city’s captivating modern skyline. Still unsure about the best of Sri Lanka for digital nomads? Well the Sinharaja Forest Reserve is here to impress. This designated UNESCO World Heritage Site is one of the country’s most beautiful national parks, offering tropical rainforests, endemic wildlife and dramatic high lands from which you can take remarkable landscape photography! Book a jungle safari for a real taste of Sri Lankan wilderness, visiting the park’s tallest canopy Hora tree and taking in the majesty of Kekuna Ella waterfall. Don’t forget to make the most of your trip with a night or three at one of our luxurious villas and apartments, found dotted around the island. To get off the beaten track and explore the quieter side of Sri Lanka, add Negombo Lagoon to your list! This picturesque region offers plenty of chances for wildlife excursions, boat trips and close encounters with native crocodiles. 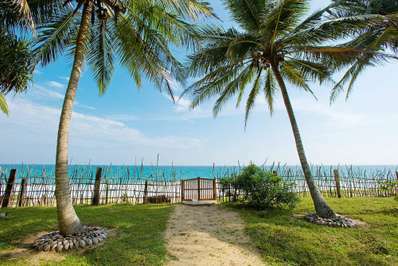 The estuary is fed into by numerous waterways and is surrounded by gorgeous coconut plantations, rice fields and natural grasslands, making it one of the top digital nomad spots in Sri Lanka in 2019. Take the free shuttle bus from Katunayake airport arrivals terminal to Katunayake bus stop, just fives minutes away. From there, take a tuk-tuk to Negombo for around 500 LKR or take a bus to Negombo centre for around 50 LKR. Swinging into the most epic sunset so far this year!⁣⁣ ⁣⁣ During our ten days in Sri Lanka, we weren't that lucky with sunsets. Most days we were greeted with cloudy grey skies barely any pockets of light. This shot was taken from our last day in Sri Lanka, the weather had been moody all day and we weren't feeling motivated to shoot sunset it but it was the last location on our list that we wanted to visit so packed up our bags and headed out.⁣⁣ ⁣⁣ As the sun dipped below the horizon, the sky erupted with colour. Changing into several different colour patterns, we just watched in awe and enjoyed the last moments in Sri Lanka. It was a good reminder that somethings in life can be totally unexpected. What is your favourite sunset you have seen? We’ve all seen this shot before! As one of the most popular Instagram destinations in all of Sri Lanka, the palm swing at Dalawella Beach will allow you to follow in the footsteps of some of social’s biggest stars. Head there for sun set to capture the amazing changing colours of the sky, and don’t forget your swimwear, because the waters and sands here are simply to die for! 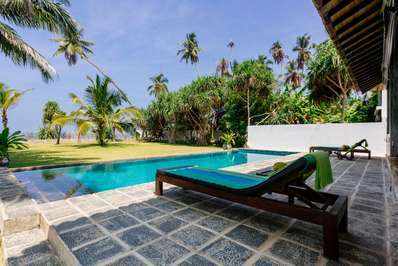 From Galle or Unawatuna Railway Station, take the train to Talpe then a tuk-tuk to nearby Dalawella Beach, approximately a five-minute journey. No guide to Sri Lanka for digital nomads would be complete without the mention of the iconic Sigiriya. As one of the island’s most important landmarks, this hilltop fortress is often described as the eighth wonder of the world and sits on a rocky plateau some 370 meters above sea level. Fill your Instagram reel with drone shots, capture the stature of the monument from the ground, or head to the top for endless panorama across the valley. Take a bus from Colombo to Dambulla and from there take another bus to Sigiriya. Buses run every 30 minutes starting at 7am and the journey takes approximately 40 minutes. An iconic landmark of Sri Lanka, the Nine Arches Bridge lies in Ella and is a sought-after sight for keen Instagrammers. Found on the beautiful train route between Ella and Demodara, the colonial-era railway bridge was commissioned by the British Government in 1921. While you’re there, take in the incredible hillside views and don’t forget to take a viral-worthy selfie, because this gorgeous bridge will be one of the most iconic digital nomad spots in Sri Lanka in 2019. You can find out more about Sri Lanka’s beautiful natural spots by checking out our dedicated guide. Ella has several train stations: Ella, Ella Railway Station and Kital Ella Railway Station, all accessible from Colombo, Kandy and Nanu-Oya. Regular buses also run from across the region, including from Bandarawela and Kumablwela. Looking at this photo, it’s easy to see why the Diyaluma Falls are one of the most exciting places in Sri Lanka for digital nomads. With spectacular surrounding views, the falls allow you to bath while soaking up the landscape. At a height of 220 metres, the waterfall is the second highest in Sri Lanka, with numerous levels and natural pools dotted along its course. Take a selfie with your partner or simply capture the beauty of the horizon. These falls are located one-hour away from Ella by tuk-tuk, car or motorbike. If video content is more your style, and you’re on the look-out for the next drone-worthy destination to transform your YouTube channel, then explore some of the coolest digital nomad spots in Sri Lanka in 2019! Perfect for diving and whale watching, Pigeon Island National Park offers an unbelievable canvas for video content. Enjoy a fascinating snorkeling tour of the reef, one of only two marine parks on the island. Located one kilometre off the coast of Nilaveli, the 1.8 square mile reef park offers pristine waters and harbors some of the most beautiful exotic fish in the world. We can’t think of a better place to start to ignite your YouTube channel, can you? Yala National Park is the only spot for getting up close and personal with some of the most incredible animals in the world. When it comes to Sri Lanka for digital nomads, Yala is an absolute must! Home to some of the coolest wildlife in the country, head here to capture video footage of Leopards, Bears and wild Elephants as you are escorted on a private safari. The park covers almost 130,000 hectares of forests, grasslands and lagoons, making it one of the richest national parks in the world. Keen to know more about what life on the road? Read the real-life travel stories of some of Instagram’s most celebrated couples. The small town of Kitulgala lies in the west of Sri Lanka and is an incredible landscape for adrenaline sports. If you’re a keen adventurer and want some exciting footage to spice up your YouTube channel, head here to try your hands at rock climbing, abseiling or white water rafting! Wear a head-cam to capture live action or create a time lapse to slow the excitement of your adventure down. Reach the town from Pettah bus station in Colombo. Get off at Hatton then take another bus to Colombo and get off at Kitulgala. Also known as Sri Pada, Adam’s Peak towers 2,243 metres into the sky. As one of the most exciting travel opportunities in the country, the mountain offers the chance for hiking and climbing, and remains a hugely important pilgrimage site for Buddhists. As Asia’s most sacred mountain, Adam’s Peak can be reached by climbing its 6,000 steps. From the top, take in awe-inspiring views or trek before sunrise to capture a truly unforgettable YouTube moment. Needing somewhere to stay during your Sri Lankan adventure? Check out our hand-picked luxury villas, littered across the country! From Kandy take a train to Hatton, then a bus to Dalhousie. From Colombo take a train to Hatton, then a bus or tuk-tuk to Dalhousie. We complete our digital nomad’s guide to Sri Lanka with one of the country’s most legendary tourist attractions. The train journey from Kandy to Nuwara Eliya is a rite of passages for many social media influencers, thanks to the region’s tea covered, rolling hills and the vibrant blue facade of the train itself! Create a time-lapse of the journey, or showcase one of the most scenic train rides in the world in all it’s spectacular glory! The journey from Kandy to Nuwara Eliya (Nanu Oya Train Station) takes around four hours. Two express trains run each day from Kandy, with the first departing at 8:47 am.